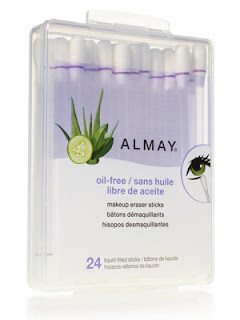 Babblings of a Mommy: Beauty Must-Have: Almay Eraser Sticks. Beauty Must-Have: Almay Eraser Sticks. No matter what, there's always makeup that strays away like shadow or mascara, it's so annoying! But recently, I discovered these brilliant little magic sticks from Almay that make this little mishap so much easier to clean up! Instead of having to use regular Q-tips and dip it into your make-up remover, you simply snap off one end and the other end dispenses eye make-up remover to erase any little messes in one sweep! Plus the case makes it great for travel or for throwing it in purse for touch-ups on the go. Genius! Why hadn't anyone thought of this before? I've seen these at the drugstore. Are they really that good? Yes! They're really a time saver and are great to have in your purse for touch-ups throughout the day. Highly recommend!